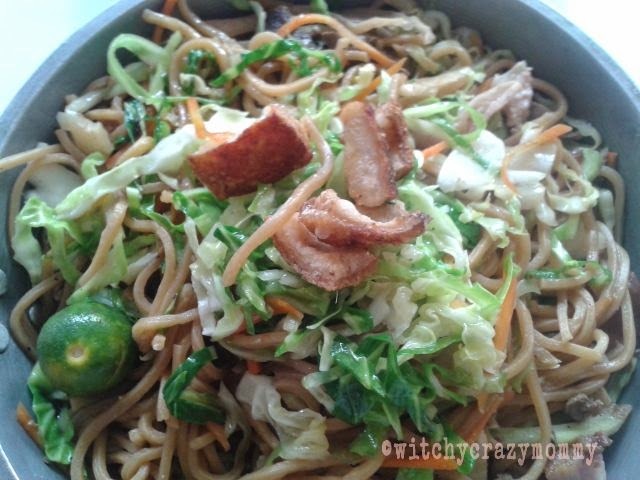 If you have been following my recipes, you should know by now that I don't really follow recipes.Crazy, right?! Here's my take on the California Maki. This is usually done inside out, with the rice exposed and nori wrapped around the veggies but you need to cut me some slack since it's my first time making this. 1. Blanch carrot and zucchini in boiling water for 30 seconds. Set aside. 2. 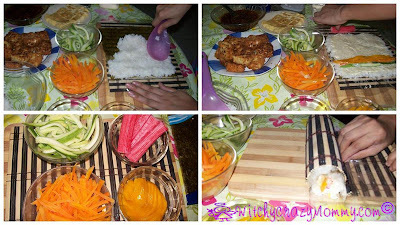 Lay nori sheet over your plastic covered bamboo mat. Spread a thin layer of rice. Emphasis on the "thin". I made a mistake of putting too much rice and ended up with a sumo-sized make. 3. 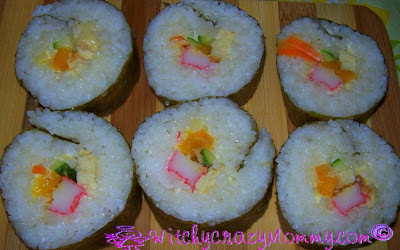 Spread a little mayo on top of the rice, arrange the half of the tamago, crab, mango, carrot and zucchini on one side and gently roll until it forms a log. Hubby called it a giant "embutido" hhmmmp! 4. Slice with a wet sharp knife and serve with Kikkoman and wasabe. * This makes 2 jumbo logs. I would die to get a taste of this. But I realized I don't need to because I already have tasted this and it was so freakin delicious! Now I've just realized I would die to get a taste of this again and of other recipes posted here. And you Thought I was Slacking! ?